Sometimes, you want to customize the display of a component to make it more suitable to your needs. Most of the time, if you modify code, you lose your modifications the next time you update. NS Recipes has been developed according to Joomla Framework requirements. 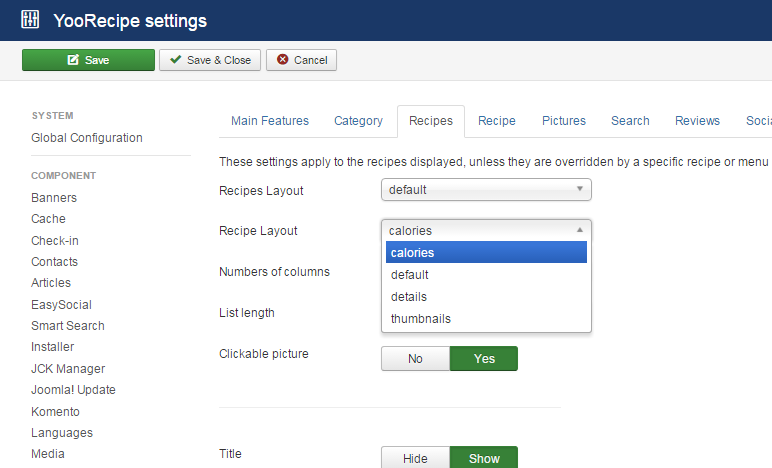 Since version 5.0.0, NS Recipes uses Joomla layouts for blog pages and recipe page displays. These layouts are defined in /components/com_nsrecipes/layouts folder. NS Recipes automatically detects available layouts in "Component Options," as shown below. In other words, adding a new display layout consists in adding a file under /components/com_nsrecipes/layouts/recipes or /components/com_nsrecipes/layouts/recipe folder. Let's assume you copied a layout to mylayout.php. Half of the work is already done. You just have to edit your mylayout.php file and modify the code as you want. NS Recipes uses PHP Objects and we assume you have at least basic PHP programming skills. Our advice is to look at already existing layouts, so that you create your own layout quickly.